We recently released a bunch of new targeting rules for our Growth level customers designed to help you create a more personalized experience on your site and drive initial AND repeat sales using Privy displays. 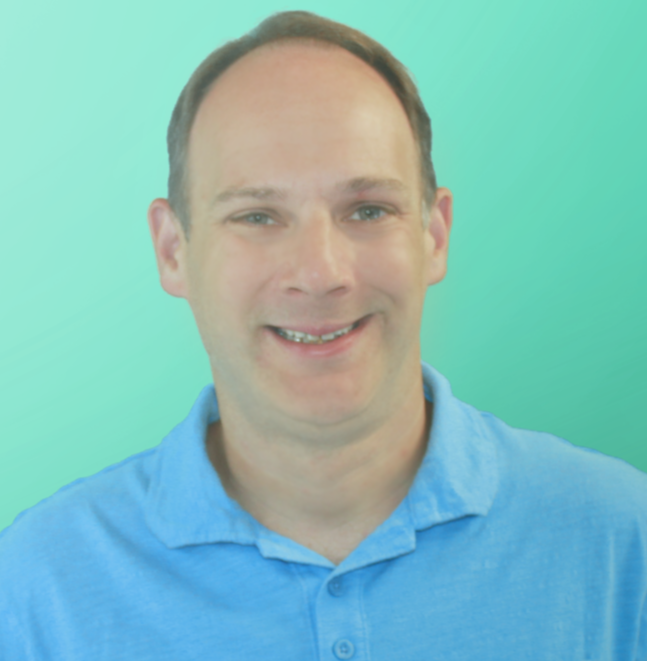 What is Order Count Targeting? The first of our new targeting rules, Order Count Targeting, allows you to choose which of your site visitors to show a display like a popup, flyout, or bar based on the number of purchases they have made from your Shopify, Shopify Plus, or BigCommerce store. This makes perfect sense, right? What you might say to a first time customer should be different than what you offer one of your regulars. And for existing customers, you probably don’t need to capture their email address anymore because you already have it. In the example below you can see exactly how this works. In the first display, you're offering a 10% off discount to shoppers who are new to you. This pop up is designed to entice them to a) opt-in for marketing emails; and b) make that first purchase from your store. Two things that are essential to building a strong, long term relationship. Once you have created your display, stay on the “Design” step and click into “Audience Targeting.” Click the “add condition” button and select “Order Count from the list. Then you can choose from operators such as ‘less than’, ‘less than or equal to’, ‘equals’, ‘does not equal’, ‘greater than or equal to’, and ‘greater than’ to set the order count you want to use. Note: The shopper must either be logged in to Shopify or have filled out a Privy form at any point to become a known contact and be eligible for this targeting rule. Looking for other ways to use Order Count Targeting? 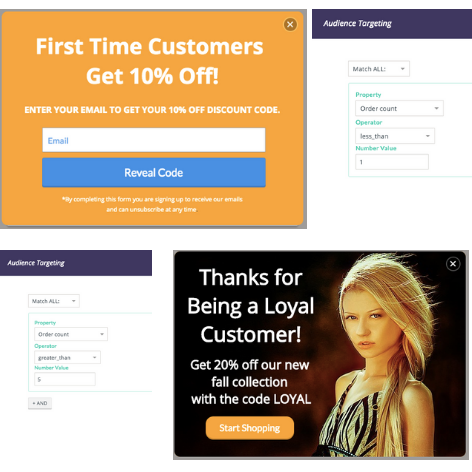 Offering different discounts to new and loyal customers is one great way to use this targeting rule, here are a few others you may want to consider. 1. 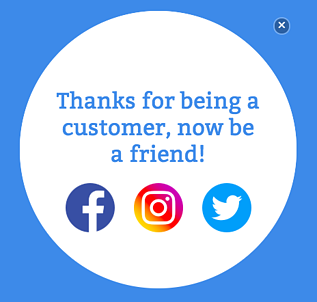 Encourage Social follows: Once someone has made a purchase and opted-in to your email list, you may want them to connect with you via social media. Use a “no-form” campaign targeting people who have already purchased (e.g., Order count is greater than 0) and watch the likes roll in! 2. Drive Rewards Program Sign Ups: Ask your customers to sign up for your rewards program and start spreading the word about how awesome you and your products are. Just use a no-form display (preferably a bar or pop up) that is shown only to people with an order count greater than 0 that includes a short message and a button that drives your customers to the program sign up page! And if you’re using Smile.io as your rewards platform, you can also take advantage of more targeting rules with the Privy-Smile integration. 3. Request a Review: If someone has placed multiple orders with your store, they are probably a happy customer. 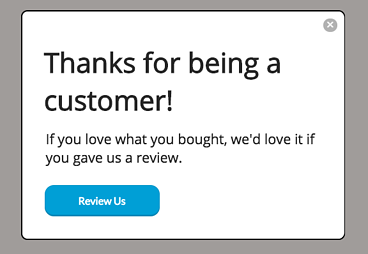 Next time they visit your site is a great time to ask them to write a review for you. By targeting visitors with 2 or more orders placed, you can use a bar or pop up to ask them to write something nice about whatever it is that they’ve purchased. Interested in learning more about this or other advanced features? Schedule a demo here.